The announcement in 2003 made by International Olympic Committee President, Jacques Rogge, rocked the athletic community. The Olympics were coming to Canada. Immediately, plans to build a breathtaking, state-of-the-art, multimedia head quarters in Torino, Italy began. Consequently, our team jumped at the amazing opportunity for Insulspan SIPS. The log frame pavilion had more than one purpose. First, promote the 2010 Olympic games and its host, British Columbia. Then, share Canadian culture with the rest of the world. Finally, showcase many of Canada’s prominent industries. Sitka Log Homes was the general contractor for the project and Insulspan® SIPs comprised the roof panels. The SIPs enclosed the enormous 4,200-square-foot log frame structure. Insulspan SIPs can be precision cut to dimensions as large as 8 ft x 24 ft. A panel of this measure significantly decreases production time and, when used for the entire building envelope, can increase energy efficiency. “We would highly recommend Insulspan for any projects for roofing or wall panels. The speed and ease certainly ensures a smoother and cleaner process in construction,” says Bramsleven. 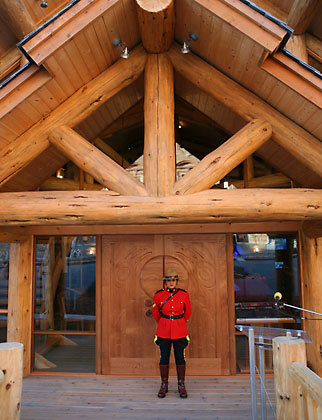 This is the highest profiled building for Sitka Log Homes because more than 100,000 people visited the pavilion during the 2006 Olympic games. Learn more about incorporating Insulspan SIPs in your next time sensitive building project by contacting us today.